So Shakespeare was obsessed with syphilis, does that mean he had it? How was Nathaniel Hawthorne’s Yankee diet related to his mysterious death? Did Jack London overdose, or commit suicide? 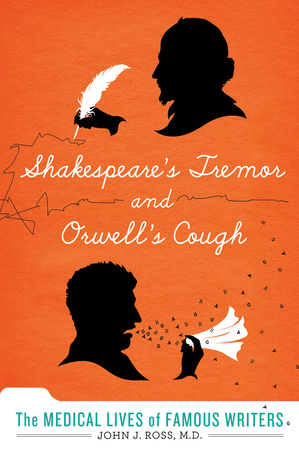 John Ross, M.D., takes up these questions and other medical matters related to famous writers in his recent Shakespeare’s Tremor and Orwell’s Cough (St. Martin’s Press, $24.99). In this immensely readable and enjoyable book, Dr. Ross culls each author’s symptoms from contemporary source material and attempts to diagnose his or her likely ailment. This book grew out of an article on syphilis he originally published in Clinical Infectious Diseases. Because Ross is a real M.D.--a physician at Brigham and Women’s Hospital and an assistant professor at Harvard Medical School--the urge to scoff at his multiple diagnoses of Asperger Syndrome is (mostly) quelled. There are chapters on Milton, Melville, and Swift, all of which will cause readers to gasp and chuckle in turn, as Dr. Ross provides a light history of the medicines and treatments they endured. I guarantee that the opening paragraphs of the chapter on James Joyce and his “irrigation” treatments for gonorrhea will make readers squirm in their seat. Tuberculosis picked off the five Bronte children one by one, a sad story with many dimensions deftly explained by Dr. Ross. Unfortunately the Bronte sisters are the only women under examination here -- what does Dr. Ross make of Jane Austen’s death? Last year, a British crime novelist claimed that Austen was poisoned, although she is commonly thought to have had Addison’s disease. Ross does discuss arsenic in a chapter on William Butler Yeats, saying that arsenic therapy was long used for many disorders, but that the “effective dose is very close to the amount needed to cause harm.” Arsenic treatments were also used on Jack London for his many maladies, but that wasn’t what killed him in the end. So Shakespeare was obsessed with syphilis, does that mean he had it? How was Nathaniel Hawthorne's Yankee diet related to his mysterious death? Did Jack London overdose, or commit suicide? John Ross, M.D., takes up these questions and other medical matters related to famous writers in his recent Shakespeare's Tremor and Orwell's Cough (St. Martin's Press, $24.99). In this immensely readable and enjoyable book, Dr. Ross culls each author's symptoms from contemporary source material and attempts to diagnose his or her likely ailment. This book grew out of an article on syphilis he originally published in Clinical Infectious Diseases. Because Ross is a real M.D.--a physician at Brigham and Women's Hospital and an assistant professor at Harvard Medical School--the urge to scoff at his multiple diagnoses of Asperger Syndrome is (mostly) quelled. There are chapters on Milton, Melville, and Swift, all of which will cause readers to gasp and chuckle in turn, as Dr. Ross provides a light history of the medicines and treatments they endured. I guarantee that the opening paragraphs of the chapter on James Joyce and his "irrigation" treatments for gonorrhea will make readers squirm in their seat. Tuberculosis picked off the five Bronte children one by one, a sad story with many dimensions deftly explained by Dr. Ross. Unfortunately the Bronte sisters are the only women under examination here -- what does Dr. Ross make of Jane Austen's death? Last year, a British crime novelist claimed that Austen was poisoned, although she is commonly thought to have had Addison's disease. Ross does discuss arsenic in a chapter on William Butler Yeats, saying that arsenic therapy was long used for many disorders, but that the "effective dose is very close to the amount needed to cause harm." Arsenic treatments were also used on Jack London for his many maladies, but that wasn't what killed him in the end.